If one wants to know where it's at in Canada, Toronto certainly never falls short of expectations! Known as Ontario's capital, it is a city bustling with energy, creativity and all things fabulous this side of the border. I was fortunate enough to be among the many Canadians who flocked to Elle Canada magazine's first Fashion and Beauty Show, where people from all walks of life clearly demonstrated their evident fashion gene and their love of all things fabulous. The event, which was held at the prestigious Carlu in downtown Toronto, brought the "fabulosity" (as Ms Kimora Lee would say!) to a whole new level. 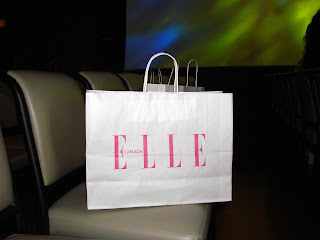 After a half-hour wait to go up to the show's floor, I quickly took in the sights and sounds as the public were ushered in and greeted with goodie bags baring the Elle Canada logo (mais but of course!). As I browsed the many different kiosks, which ranged from lip gloss celebrity favorite Balm Shell, to advice from skin care giant Dermalogica, and even a booth for Elle Canada subscriptions (which attracted potential readers with the sweet addition of a free tote! ), I couldn't help but anticipate the days' events. Armed with the best accessory a woman can have (my lovable boyfriend Wil), I set out to accomplish a few specific tasks and was intent on not missing the beat!